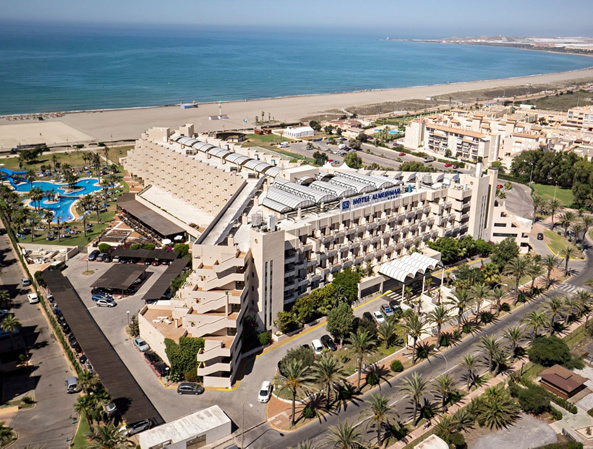 The ever popular 4 star modern Almerimar Resort (formerly the Melia Almerimar) hotel is one of the best hotels along the Costa de Almeria, the hotel is one of two quality hotels located right by the sea in the small port and holiday resort of Almerimar. This super hotel is situated in an ideal position overlooking the beach, a short stroll from the picturesque yachting marina and opposite the resort's 27 hole golf course, the hotel attracts families, couples and golfers alike and provides a wide choice of holiday facilities. The hotel boasts 278 well appointed guest rooms that include 140 double standard rooms, 87 superior rooms, 22 single rooms, 24 junior suites, 1 presidential suite and 4 rooms designed and dedicated for handicapped guests. All the rooms are fully equipped with central air conditioning/heating; satellite TV, direct dial telephone, mini-bar, hairdryer, safe, Wi-Fi (free Connection) and room service. The Almerimar Resort hotel has a choice of bed and breakfast, half board or full board arrangements. 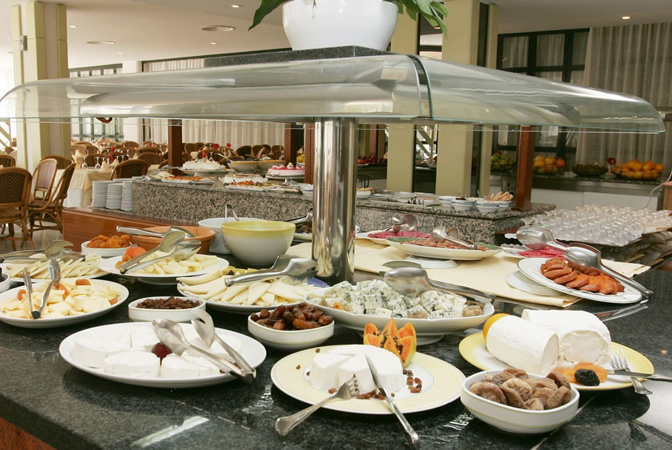 The hotel provides a variety of excellent international cuisine with buffet service and show cooking. During the day the Gaviotas snack restaurant's terrace is the place to enjoy a light lunch and watch the world go by. The lobby bar Brisas is the place for an evening drink and in the summer months the hotel provides a daytime and evening entertainment programme. The hotel has a wealth of facilities for you to enjoy, there are 2 different swimming pool areas with complimentary sun loungers, one pool for adults and the other specially designed for families with children, a fitness centre that includes, a heated indoor pool, 2 Jacuzzis, sauna and a Turkish bath. The hotel also provides a hairdresser, 2 squash courts, modern gym and massage service. 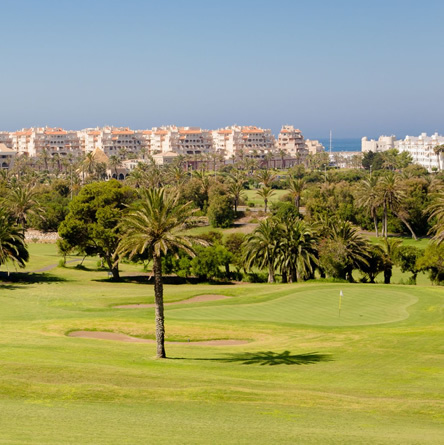 The Campo de Golf Almerimar 27 hole golf course is set opposite the hotel, the picturesque course will appeal to golf lovers as it is quite flat, laid out amongst lakes and palm trees, with wide well tended fairways and greens. Facilities on offer in the hotel include a 24-hour reception, foreign exchange service, a public Internet terminal (additional fee applies). Free Wi-Fi including guest rooms and public areas, car parking, online tee off times for golfers, a children's mini club operates in peak season, there are meeting rooms and wedding receptions are a specialty of the hotel. 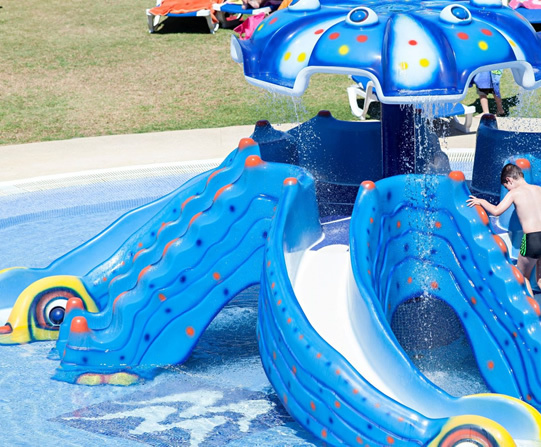 For excursion ideas and opportunities click Almerimar to see more information.